Mr Cashback is here, and he wants to make you rich, which is very nice of him. To do that, he's invented (or rather, Playtech has invented) this five-reel, 15-payline slot. With a jackpot of 7,500 and a very low minimum bet of 0.15 coins, you might just strike it rich. It might be an older game, but this is a straightforward slot with some great features which have made it one of the most popular slots at a number of online casinos. If you want to know why, then read on. You'll see why the Mr Cashback online slot is certainly worth a spin or two. Play Mr. CashBack for Real Money! In this game, we join the eponymous Mr Cashback, a cigar-chomping, clearly well-fed gentlemen with a penchant for green pinstripe suits. The game intro is upbeat and introduces the character well, although the graphics and sound are fairly standard – nothing will really jump out at you. That's okay though, because this is quite an old slot, and it's what's under the hood that really counts here. In terms of the interface, everything is clear, especially the contrasting reels and bright symbols. 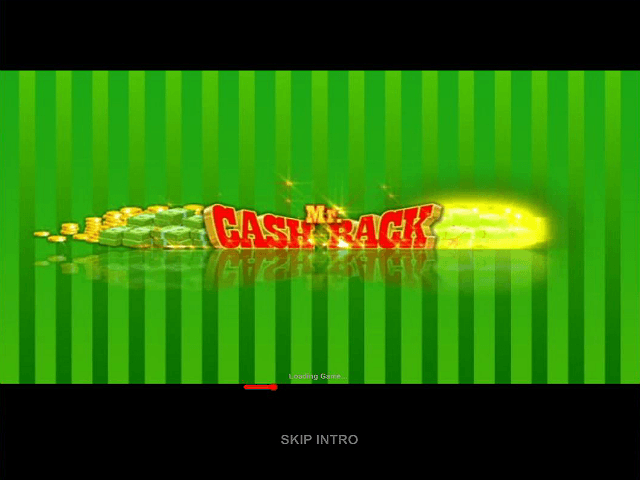 Green is definitely the colour of money around the Mr Cashback slot world too – it comprises 90% of the screen space. Luckily, all the stats and info are still clear. 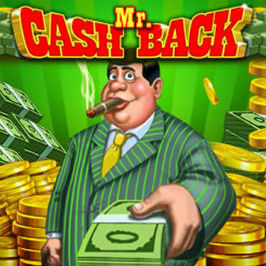 The mix of numbers and letters, much like other online slots, are the lowest value symbols in Mr Cashback. If you want to get a good return on your stake, then try to match up the higher value symbols, which include large wads of cash or bags of coins and piggy banks. 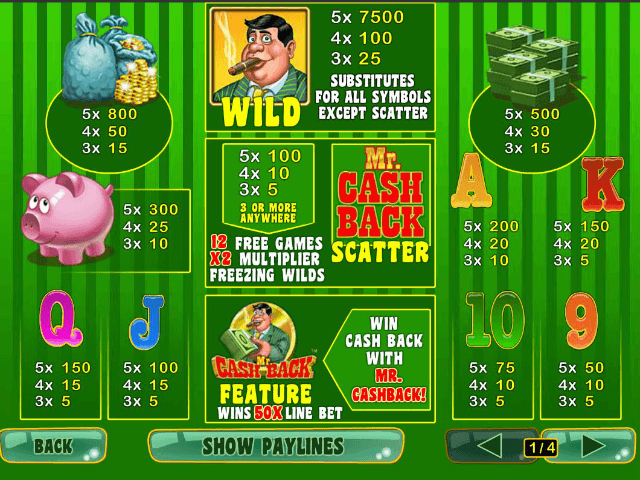 You also get a lot of choice with your bet when you play the Mr Cashback slot game. You can stay as low as 0.15 coins per spin, but if you're after an ultra-exciting game, you can place a huge stake of up to 750 coins. That might seem like a big risk, but there's a particular feature in this game that could really make it pay off, as we'll see. The jackpot is triggered if you can line up five of the one and only Mr Cashback himself. 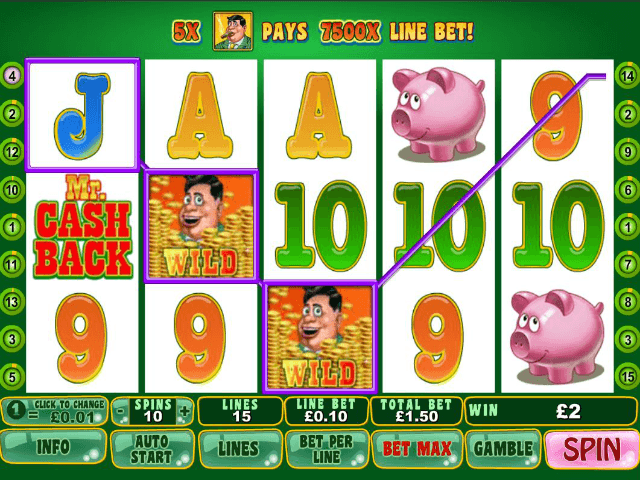 He also doubles up as the wild for this online slot. The 'Cashback' is the scatter. If you can get three of these on any of the reels you'll activate a 2x multiplier. Each spin can give you at least one wild that’ll also last for at least one spin. The 'reel' stand out feature though, is the fact that if you don't get a win on any payline after 50 spins, Mr Cashback steps up to the mark and lives up to his name. You'll get 50x your initial line bet back. What’s more, your line status is even saved if you have to put the game down for a bit, but want to carry on later. It's a great feature that makes this slot very satisfying to play, even if you're having a bad run. Share this Mr. CashBack Review today! 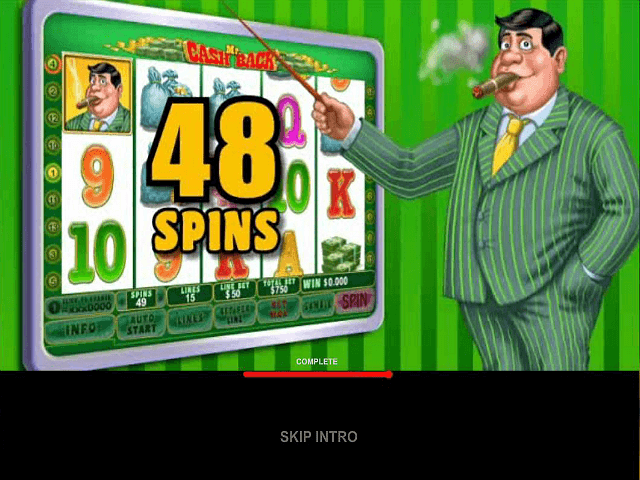 If you like Mr. CashBack, you'll love these slot titles too!